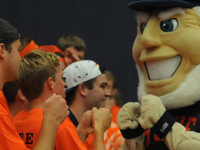 DeWitt Tennis Center is Hope College’s indoor tennis facility. Opened in 1994, the center contains six courts and men’s and women’s locker rooms. The center supports the Hope tennis teams and is also open to the student body for intramural games, tennis classes or recreational use. The Professional Tennis Registry rated the DeWitt Tennis Center the National Public Facility of the Year in 2010. DeWitt Tennis Center is available to Holland community members, providing both junior and adult programs, as well as summer academies and private lessons. Since 2003, the center has produced more than 32 High School State Champions and their players have qualified for the Midwest Closed Championships on 63 separate occasions. Their experienced staff has developed more than 184 High School State Champions and three individual USTA National Champions. The facility is named for the Gary and Joyce DeWitt family.